The Laguna hotel and resort complex is located to the quiet north of 8 km long Bangtao Bay in Thalang. It is a laid back and relaxed and feature family friendly hotels such as Outrigger and Angsana Laguna which are renowned for their family friendly facilities as well as annual family events usually during July August. 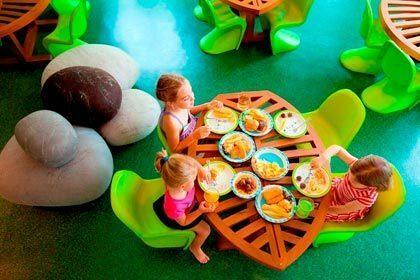 The outrigger Laguna Phuket kids club is open daily from 09:00 am until 17:00 pm. Baby sitters are available 24 hours at 300 Baht per hour during the day and 400 Baht per hour after 18:00 pm. Please note these prices were applicable at the time of writing and subject to change. The resort offers a diverse range of daily activities and adventures for kids which are both stimulating and informative. On each adventure professional nannies accompany children to ensure a safe and pleasant experience. If yours are just out of diapers, or even still in diapers and require one-on-one child care, then Outrigger Laguna's nannies will entertain your children with authentic Thai culture experiences through activities such as language lessons, Batik painting classes and leaf weaving combined with the Thai's natural love of kids. There is even an induction session to fully understand each child's individual requirements, a daily written report to parents and a complimentary gift bag for children. The culture Kids package is available to children 1 to 12 years of age 8 hours per day and needs to be booked for at least 4 consecutive days. PLEASE NOTE THAT THE ACTIVITIES MAY BE CHANGED WITHOUT PRIOR NOTICE.